The moment was pregnant with meaning. I stood on the sidelines, microphone in hand, and watched the countdown clock move backward from five minutes. The platform waited. Soon I’d climb her stairs and, once again, lift the mic to do what I’d long felt called to do. The significance was not lost on me, not after all that had happened. I’d been given a gift. A marvelous extension of Divine mercy. Even so, with each disappearing second my throat tightened until I wasn’t sure I could push any words through. Doubt shadowed any shine. I doubted the plane ticket I purchased the month before. I doubted my confidence to attempt to speak so soon after surgery. I doubted my ridiculous optimism, that crazy achiever part of me that tries to tackle more than I should. For the love, what was I thinking?! I’d made a mistake. I fumbled with the microphone and felt it slip in my sweaty palm. The truth is I wanted to run fast and far away. Breathe, dangit. You can do this. You need to do this. True. This wasn’t a “can” moment; it was a “must” moment. I had to do this. When you and I endure a trauma—a struggling child, a failed assignment, a lost dream, a broken relationship—our first impulse is to withdraw. Like a rabbit threatened by a wolf, we retreat to a haven until the danger passes. We circle up the family, cancel appointments, cut back responsibilities, and tend to the wound. It’s both wise and necessary. But the problem with a haven is how easily it becomes a hideout. 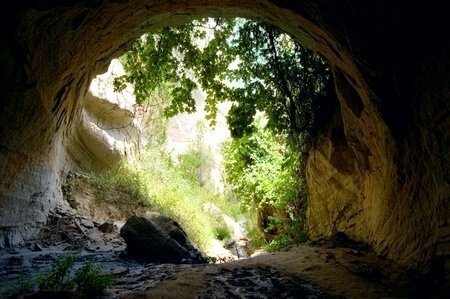 Whereas a haven is about necessary nourishment, a hideout is about minimizing risk. It’s a place to push “pause” on life, indefinitely, so you don’t have to feel exposed, vulnerable, or (heaven forbid) more pain. Over the prior months, I’d seen my haven slowly morph into a hideout. “What if?” had hijacked my tasks and calendar, creating a perpetual state of limbo. The doctor said we’d “wait and watch.” So I pulled back, holed up. To wait and watch and mitigate the danger. But the longer I isolated, the easier it became to disconnect. The longer I withdrew from life, the less motivated I felt to live it. The danger wasn’t on the platform. The danger was the temptation to never step on it again. To live is to walk through. To step out of safety and assume a little risk. To connect, share, try, believe. To push forward when everything in you wants to turn back. And to refuse to make this moment about what may or may not happen in the next. My friend, whatever wolf has you cornered, you have a choice. Watch life from a safe distance? Or step out and live it? There’s a time to find your haven, to mourn and rest and heal. But if you stay holed up forever, the wolf has won. The clock is ticking. Your stage is waiting. Push through. Kill the wolf. And live. Are you hiding? Where do you need to push through, assume a little risk, and live? Thanks for this. Your words really hit home. Most of my life has been spent decorating my hideaway, creating a safe, comfortable place to hunker down and live. But that’s not living. It’s a shadow existence mimicking life and distracting me from the days that are rushing by. These past few years God’s been showing me that growth can’t occur from inside my comfort zone. Only staring fear in the face and still pushing through will create the joy-filled, purpose-driven, and Christ-saturated life I was born to live. Hideaway decorating can be quite the fulltime job, Kim? Boy, I’ve been there. Many times. But the promised land waits on the other side of the sea. 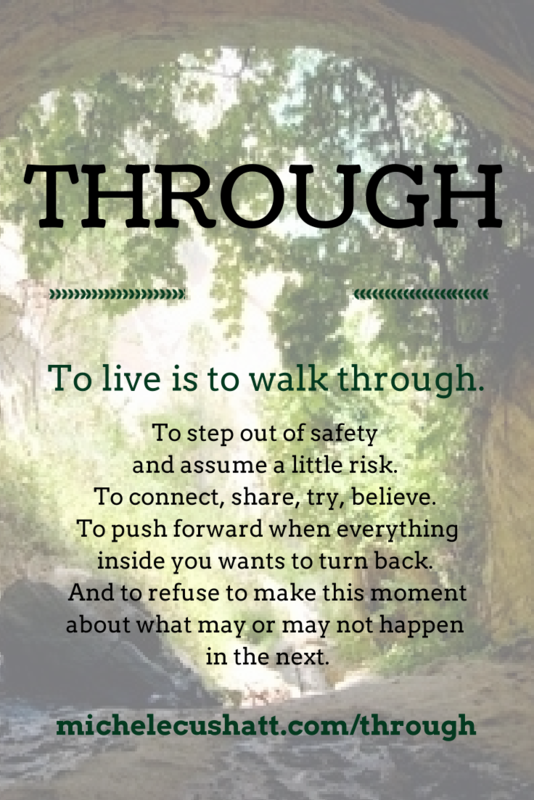 If we can muster the courage to walk through. You are so very brave, Linda. You push through and live day after day after day. Your determination and “choosing” of joy inspire me! Thank you. Your words serve as a confirmation to push forward, despite the temptation to pull back and hide this bruised heart. The life of a writer and speaker (especially a newer one) is fraught with rejection and waiting. I pray that in those times, we might only hear the voice of our Lord, calling us toward Himself. How difficult it can to be discern the voice of God and the voice of the enemy in the quiet moments! PS… Thank you for pushing forward, Michele. You are such an inspiration. Oh, yes. The writing/speaking world is one ripe with the temptation to quit. Sometimes every. single. day. Keep fighting the fight, friend. LOVE your juxtaposition of “haven” and “hideout.” I hadn’t thought of it that way before…such a great ah-HA! moment for the morning. I really, really needed to hear this today. THANK YOU from the bottom of my heart! Glad to hear it, Carrie. You can do it! Yep! You, Michelle, spoke right straight to my heart…I have been kind of hiding out in my haven, leaning on Jesus with the excuse that in the small community in which I live, I know no one who has had the same experience as me…but in two weeks, I will be holding the mic in my hand sharing our story with women in our community. You see, I know God has given me a message to share with my story and I am not going to ‘let the wolf win’. I am going to take the platform on that day and look forward to many more platforms! Thank you dear sister, for encouraging and strengthening my heart with your precious words. I praise God for the healing power of the blood of Jesus at work in your body, perfecting and completing the work He began in you. Michele – Tell me this again on June 20 before I step on stage for the first time at a conference in Tulsa. My stage is waiting. Thanks for being bold and climbing back on the stage. Michelle, Your post resonated loudly. My husband and I have spent a little more than a year living in the only part of the world we said we never wanted to live in, because we were called here. In this land we have faced our own fears and perceptions, and urban legends. We have walked with more faith and less sight. And ohhh how we have grown. Before our move, during our move and so many days since then I’ve played Chris Thomlin’s song “Whom Shall I Fear”, and then pushed through. Gentle words providing a swift kick in the pants. Thanks! I desperately needed both! It was so brave of you to step on that stage. I had tears running down my face wanting to tell ever one in the audience, “Do you KNOW what this lady has been through?” They didn’t. There was not a trace of your struggle. Not a scar that could be seen. Not a lisp to be heard in your voice. No fear that could be seen in your eyes. I’m so proud of you. And so glad that you have now shared how hard it was to get back up on that horse. Since coming home from the conference, I have felt myself wanting to hide in my comfy place. I wrote in my journal today: I’m scared. Scared to the point of not being able to move forward. What if I try and no one cares? What if I try and I don’t get a following? Left and right I’ve had confirmation to keep moving forward. Your blog post being one of them. Big hugs to you for this struggle and the others that you are facing. Michele, thank you so much for this post! I love the concept of the haven vs hideout, and the haven being appropriate for a time but not getting stuck there. Powerful. Thank you also for your transparency in sharing this. You were so incredible at the conference every time you stepped on stage, I would never have suspected an ounce of self-doubt. That encourages me. Thanks for pushing through and sharing your gift with us! I am thankful you pushed through Michele. Your outstanding message at the SCORRE Conference was inspiring and motivating. May your recent release inspire others to push through to their calling and purpose. Thank you! Thank you, Don. So glad you were with us at SCORRE! Beautiful post Michele. It reminds me of how I walk through tough stuff, which is to remember that I have no idea who needs to hear the message only I can deliver. I thought I had received everything Sunday morning right before you spoke. Then you spoke and I realized that everything I was meant to hear came directly out of your mouth. Thank you for your words, Elizabeth. So glad we could meet face to face!